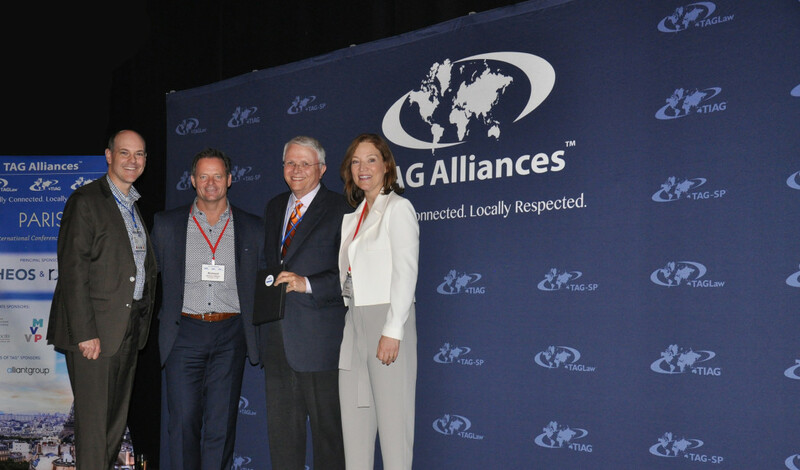 At the recent TAGLaw and TAG Alliances International Conference in Paris, France, Kirton McConkie was recognized as one of many TAGLaw member firms that have belonged to the organization for 15 or more years. Founded in 1998, TAGLaw® is a leading international alliance of more than 160 independent law firms in over 90 countries. Kirton McConkie joined TAGLaw in 2001 and remains one of TAGLaw’s most active and highly-regarded member firms. As a testament to Kirton McConkie’s commitment and support of TAGLaw, over the years, partners of the firm have been appointed to TAGLaw’s Advisory Board, served as co-chairs in TAGLaw’s Specialty Groups, and have been a resource to members around the world who have clients that are seeking to do business in the Utah and the United States. Receiving the award for Kirton McConkie were Ryan Frazier and Willis Orton, pictured below with Richard and Melissa Attisha, the President and Executive Vice President of TAGLaw. Founded in 1998, TAGLaw® is an international alliance of more than 160 independent law firms. In 2017, Chambers Global ranked the alliance “Elite”, the highest ranking awarded to legal networks. The TAG Alliances comprise three groups: TAGLaw, TIAG® (The International Accounting Group), and TAG-SP™. TIAG is an international alliance of high quality, independent accounting and TAG-SP is a complementary association of strategic business partners. Collectively, the TAG Alliances provide accounting, legal, financial and business support services on a worldwide scale. With approximately 16,000 professionals in over 285 member firms, and more than 675 offices in over 105 countries, The TAG Alliances serve tens of thousands of clients from all industry and commercial sectors. Learn more at www.TAGLaw.com.